Given today’s fast paced world where companies are only as good as their latest innovation, be it either the latest high-tech gadget or Tide in “extra, extra clean” formula, it’s no wonder executives are clamouring to buy out the competition to gain greater scale as a source of competitive advantage. 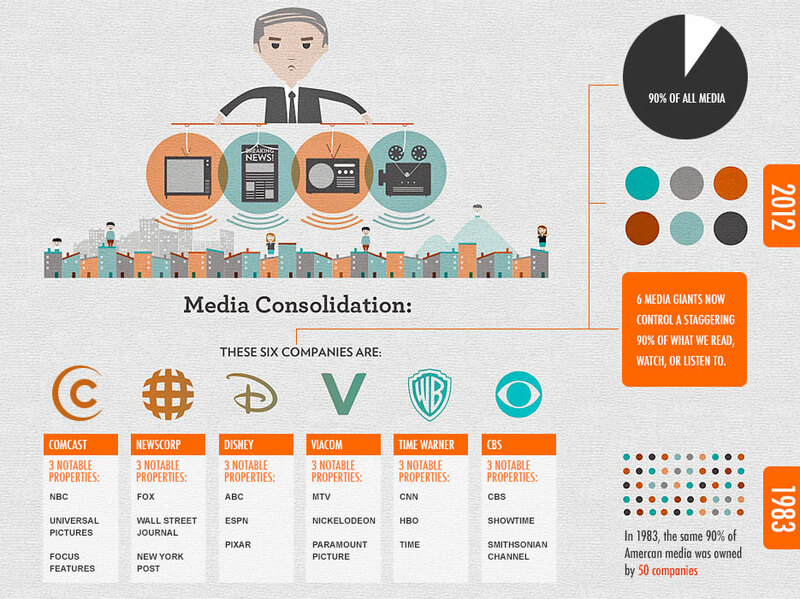 In terms of media companies, convergence is simply a product of the times, intensified by globalization which is characterized by Jackson, Nielson, & Hsu (2011) as “constant and rapid movements of all sorts across national boundaries, from the financial, cultural, and social to the exchange of information”. But the greater question is – what are the consequences of such a consolidation of power by a diminishing number of participants? Is the convergence of media simply an inevitable outcome of today’s economy or is there something more sinister looming in the distance when it comes to the importance of the global share of voice? From a media company perspective, powerhouses such as Disney-ABC, NewsCorp-Fox or even Bell Media-CTV, believe it is a necessary action to ensure they continue to have greater scale and synergies to combat the advent of new technologies and competitors like NETFLIX who are growing at an exponential rate. Greater scale allows for costs to be shared across various channels helping the company to stay lean and efficient. For instance, when an event emerges, one reporting team can be sent to cover the story with the content shared back across multiples channels- TV, radio, print and web. The ability to keep costs down then allows the company to reinvest providing more niche content. Or do these savings simply fall to the bottom line? A larger media company can also offer a wider selection of branding opportunities to advertisers, providing higher discounts for larger investments, making the media companies more of a one-stop-shop for advertisers looking to achieve higher impressions with smaller budgets. Alternatively, convergence can pose a concern for smaller, independent media players. How could they possibly compete against these larger corporations with endless resources and finances? When these smaller players fail, who typically service smaller communities; it is truly the loss of local, independent voice for that community, which is certain to impact local culture. Jackson, Nielson, & Hsu (2011) remarked, “There has been a growing and legitimate concern that global media concentration will respect no local cultures, traditions or customs as long as those factors stand in the way of profits”. However, successful examples exist where a large, National company has acquired a smaller, local player such as CTV’s acquisition of ATV. Under this example strong local content remains an active focus. The media landscape is changing quickly. Technology is allowing new entrants to easily enter the market and certainly cause concern for large multi-national media conglomerates. All we need to do is look at how our access to media has changed over the last few years to see this in action. Mobile and IP based access is skyrocketing – all at the expense of traditional print and broadcast channels. Within Canada, this is even more relevant given our already skewed perspective based on the shear mass of influence coming from the US. With this perspective in mind – are convergence and vertical integration the only options to fend off these new entrants? Throughout the remainder of the course I intend to dig deeper into this area to provide a well-rounded perspective. 1 Response to Media convergence and vertical integration – death of the local voice or the essential evolution of an industry?